In the bacteria killing competition silver is the undisputed champion. Rather ruthlessly it destroys up to 99.9% of all bacteria that try to get near your toothbrush. Nano-b Silver is made of 1,600 bristles integrated with genuine silver nano-particles. These particles release negatively charged ions that penetrate bacterial cells, suppressing the cell s respiration and metabolism. This kills bacteria and prevents further growth on your toothbrush as Nano-b bristles are resistant to any airborne bacteria as well. This keeps you healthy and safe from the dangerous, harmful bacteria found on most toothbrushes. It s not just about being antibacterial. Nano-b is committed to providing a toothbrush that offers superior cleaning capabilities. All Nano-b brushes come with a double-layered bristle structure. The long, thin bristles clean deeply in hard to reach areas of the mouth, gently pushing the gums upwards to remove bacteria where it gets trapped, preventing common plaque buildup. The short, oval bristles polish the surface of the teeth, leaving you with a sparkling, beautiful smile, while protecting the soft tissue of your mouth from damage. Bad breath is an important dental problem and can have many different causes. One thing is certain however, the main reason for bad breath is build-up of bacteria in the mouth. 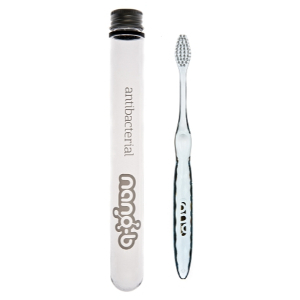 By brushing with Nano-b Silver, you are confident you always use a bacteria free toothbrush. Furthermore, nano-b's unique bristle s design and structure help to remove plaque and bacteria thoroughly. This reduces harmful bacteria on your teeth and mouth and less bacteria means better breath. Whet it comes to toothbrush bristles, round is better. Most toothbrushes on the market are not designed for people suffering from sensitive teeth or bleeding gums. Their bristles are manufactured in a way that makes their edges very sharp. So, when you brush your teeth they hack on your enamel and gums damaging the soft sensitive tissue. Nano-b is different a special manufacturing process cuts Nano-b s bristles in a way that rounds their edges. These rounded edges still perform greatly when it comes to cleaning, but they can t harm or damage your teeth and gums as most toothbrushes do. Nano-b brushes are clean, smooth and transparent. They come in a range of crystal colours, have smooth handles and a beautifully nimble head. Finally, a brush that looks good in your bathroom. With Nano-b you ll never again wonder where to store your toothbrush when you travel. Nano-b Silver comes with its own travel case, which is ideal for storage and travel. The antibacterial properties of Nano-b Silver are completely natural. Silver is widely used in the medical industry and is proven to be safe and beneficial.